While NAB is all about high-end cameras and workflow solutions for broadcast professionals, the show is a great opportunity to talk about industry policy as well. 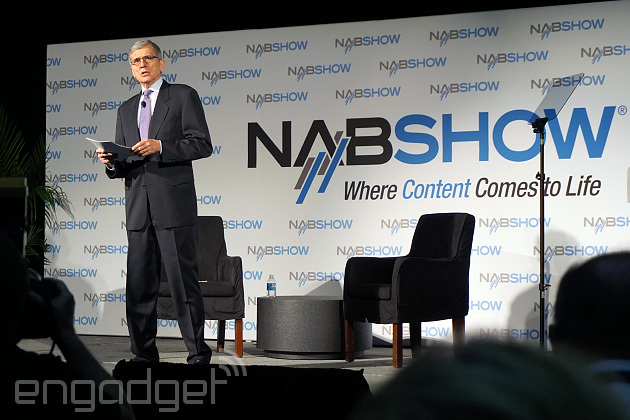 Yesterday, NAB President Gordon Smith criticized the FCC for "favoring broadband over the broadcast industry," and today FCC head Tom Wheeler took the stage to address a broadcast-heavy crowd. In his one-hour talk, he touched on the importance of competition and the FCC's role in carrying out the US Senate's mandates, but the most interesting moments came when Wheeler lectured broadcast licensees on their need to adapt and change. "Lecture" may be putting it lightly, though; the implication in Wheeler's remarks was that broadcast companies haven't evolved as quickly as services like Netflix, and that there's some serious catching up to do. According to the chairman, third-party content providers such as Netflix and Hulu are effectively eating broadcasters' lunch by purchasing programming from the same studios and networks that broadcasters do. Considering how often Americans watch TV news online, Wheeler said, there's a great opportunity for broadcast licensees to leverage local content to become more competitive. Rubbing a bit more salt in the wound, he also mentioned Yahoo's recent efforts in news syndication and telecom companies' ventures in broadcast LTE. As he explained, "Clearly, Yahoo, AT&T and Verizon are... all embracing something new that looks startlingly like your model. Because we are pro-competition, we hope broadcast licensees will see this as a call to action." Finally, Wheeler closed by addressing the upcoming spectrum incentive auction in 2015. He believes the sale represents "a terrific financial opportunity for broadcasters," as it gives them the chance to expand business on somebody else's dime. No shortage of marching orders for an industry looking to solidify its competitive stance, but Wheeler's message was overall a positive one: "We want to work with you to focus on the future. Our job at the FCC is to facilitate innovation."